When you set Data Type to ER Entity’s attributes in Astah, you can choose it from the [Data Type] list in the [Base] tab of Attribute’s property view. If you cannot find the one you want, you can always add from [ER Data Type] menu. Here is an example of adding one – [VARCHAR2]. 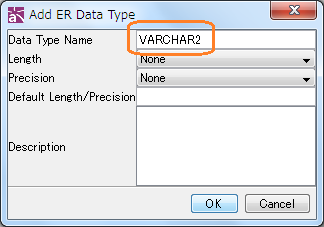 Enter [VARCHAR2] for Data Type Name and the click [OK]. 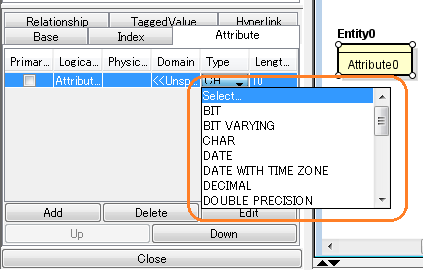 You can set property for the length and precision of data too. That’s it. Now [VARCHAR2] is in the list! Easiest way to import database tables into Astah. Create Entity models by importing a list of ER Entities on the Excel spreadsheet. Export ER Models to HTML files with one click. This entry was posted in TIPS and tagged ER Diagram, ERD. Bookmark the permalink. This is a good software solution, I use creately diagram software to create ER diagrams.